Fearful and shy to the point of agoraphobic, Em Moore is the writing half of the successful celebrity-biography team, T.E. Blakemore. Her charismatic partner, Teddy Blake, does the interviewing, the negotiating, the public glad-handing. But Em’s dependence on Teddy runs deeper than the job – Teddy is her bridge to the world as well as the main source of love in her life. When Teddy dies in a car accident, Em is devastated, alone in a world she doesn’t understand. The only way she can honor his memory and cope with his loss is to finish their current project – an “autobiography” of the renowned and reclusive film director Garrett Malcolm. Ensconced in a small cottage near Malcolm’s Cape Cod home, Em slowly builds the courage and strength to interview Malcolm the way Teddy would have. She finds the director at once friendlier, more intimidating, and far sexier than she had imagined. She soon senses trouble between Malcolm and one of his former stars, the washed-up Brooklyn Pierce, and she hears whispers of skeletons in the Malcolm family closet. When the police begin looking into the accident that killed Teddy, Em’s control on her life – tenuous at best – is threatened. ". . . A captivating story of love, rivalry, and revenge." Multiple award-winner Barnes, best known for her mysteries featuring street-smart Boston P. I. Carlotta Carlyle, strikes out in a completely different direction in her latest, a stand-alone that takes time to develop but ultimately delivers a delicious twist. Naive Em Moore is the silent partner of a writing team whose biographies, published under the name T. E. Blackmore, have garnered the authors big bucks; Em, though, is a bundle of anxieties, which has kept her out of the limelight and virtually unknown despite her brilliant writing. They have also kept her dependent on her partner-mentor-sometime-lover, Teddy Blake. When Teddy dies in an automobile accident, Em comes out of seclusion to continue the book they started on celebrated actor-director Garrett Malcom, who is working on a production of Hamlet. Em is rebuffed by Malcom at first, but her surprising stubbornness coupled with her obvious adoration of Malcom and knowledge of Shakespeare’s drama help her worm her way into Malcom’s life. As the relationship becomes more intimate, so, gradually, do her doubts grow about his honesty. It seems that Malcom, like Teddy, has secrets not meant to be revealed. Em’s dramatic story of rebirth, addressed to Teddy in absentia, unfolds with the fitting precision of a stage play. The many references to Hamlet give readers plenty to think about as they parse the truth from Em’s undeniably skewed perspective on everyone around her. An outstanding effort from Barnes, who had been silent since Lie Down with the Devil (2008). This is one of the best books I’ve read this year. It kept me up past bedtime many a night. I’ve reached overload on the gimmicky sleuths, so I cringe on reading a book jacket where the hero only sees black-and-white, has a photographic memory, etc., but agoraphobic sleuth Em Moore is so well done that I was hooked on the first page. She’s part of a ghostwriting team, and she addresses the entire book to her writing partner, Teddy, who has died in a traffic accident before the book begins. There’s something fascinating in the way she describes to this absent person how she manages to brave public transportation and travel farther and farther afield to try to finish the book they were working on when he died. The book is a ghosted “autobiography” of a star director who lives and works in a family enclave on Cape Cod. Em ends up moving there while she continues interviewing, writing and searching for a missing interview tape that appears to contain a blockbuster revelation. In this standalone (and Barnes's first book in five years) by the multiple award-winning author of the Carlotta Carlyle mysteries (Flashpoint), the fast-paced action, compelling characters, alternating interview fragments, police reports, and Em's first-person narration will keep readers up long into the night, waiting for the full revelation of the particulars, which include a sharply surprising and satisfying twist. Linda Barnes reaches new heights with her novel The Perfect Ghost, a tale of celebrity and the dangers the desire for it can bring. Em, the flawed and fascinating protagonist of this literary mystery, is wily and driven, perhaps too driven, as she barrels down a twisty road leading to a spectacular and unexpected ending. Bravo. 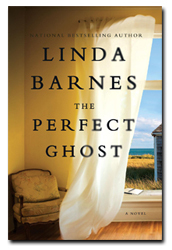 In The Perfect Ghost, a stunning breakout novel from the beloved author of the Carlotta Carlyle mystery series, Linda Barnes slowly winds the strings tighter and tighter, leading the reader ever more deeply into the lives of her characters with pitch-perfect pacing and mesmerizing prose. "Don’t be surprised if Linda Barnes gets an award for The Perfect Ghost, . . ."
The Perfect Ghost is a bundle of surprises. The first comes from an established series author spinning off to produce a stand-alone novel. If you’re a regular follower of publishing industry news or Ms. Barnes’ website, this won’t surprise you. But ordinary readers waiting for the next Carlotta Carlyle mystery may be caught off guard. The next surprise comes from the main character, Em Moore. She’s about as opposite from the bold P.I. Carlotta as a gal can be. Em is not just shy: She lives in a near constant torture of anxiety and has set up her life to minimize contact with the outside world. She only survives within it because of her writing abilities. Em manages to hook up with a former teacher, Teddy, who ghostwrites celebrity autobiographies. Through their partnership she finds love, trust, friendship, guidance, and opportunity. But then her mentor is killed in a car crash, leaving her alone with a contract and deadline for their potentially biggest bestseller yet.